More significantly, Nunn also embraces Shakespeare's probable collaborator on this play, George Wilkins, a pamphleteer, innkeeper (perhaps operator of a brothel, according to court records), and sometime dramatist. Gower (Raphael Nash Thompson) makes his first appearance in the Theatre for a New Audience's production of Pericles at the Polonsky Shakespeare Center. Below, the parade of contestants in Pentapolis in which knights present their emblems to Thaisa (Gia Crovatin), daughter of Simonides (John Rothman) in the background. Photos by Gerry Goodstein, Theatre for a New Audience. What you might expect with Trevor Nunn taking on William Shakespeare's Pericles—if you have some awareness with Nunn's previous work staging the Bard—is an outside-in approach to this malformed play. This is the director who, when he was artistic director of the Royal Shakespeare Company in the 1970s, mounted a musical version of Comedy of Errors (based wholly on Shakespeare's script) and a small-space, allegorically costumed Macbeth featuring two of England's biggest stage stars in the title roles (Ian McKellen and Judi Dench). This is the director who was instrumental in bringing Cats, Les Miserables, and Nicholas Nickleby to the stage. When I first heard that Nunn was going to direct Pericles at the Theatre for a New Audience (TFANA) in Brooklyn this year, I renewed our subscription to the theater, even though it was the only show on the company's calendar I knew we could get to. Trevor Nunn plus Pericles equals—well, high expectations, at the least. However, also contributing to my high expectations was Joseph Haj's take on the play in the Oregon Shakespeare Festival production last year that we saw at the Folger in November, and Jim Warren's text-centric but ingeniously carried off American Shakespeare Center version at the Blackfriars Playhouse in 2014. This play I so often had maligned was proving to be good entertainment before Nunn put his stamp on it. In helming Pericles—not only his first attempt with this piece (the only entries in Shakespeare's canon he has not done are King John and A Midsummer Night's Dream) but his first Shakespeare production originating with an American cast—Nunn starts from deep inside the play. Rather than putting his own stamp on the piece, he embraces its unique construction and strict formality. What you get, in the least, is a fully formed Pericles. In fact, even given ASC's text-centric version, Nunn has hewed closer to the formula and spirit of the play—something akin to a Greek tragedy or opera—than any version I've seen before. More significantly, Nunn also embraces Shakespeare's probable collaborator on this play, George Wilkins, a pamphleteer, innkeeper (perhaps operator of a brothel, according to court records), and sometime dramatist. Stylistic studies have identified his hand primarily in the first half of the play, and he published the novel The Painful Adventures of Pericles, Prince of Tyre in 1608. The relationship between play and novel is still in doubt—scholars are divided on which came first—but that there is a relationship is what matters most to Nunn, who uses passages from the novel to further fill out the action in his production of the play. These embellishments have merit. However, making the staid formality and 2-D characterizations of Wilkins' script the foundation for staging the whole play is a major challenge Nunn's choice must overcome. For all its faults, Pericles is worth the watching and the reading for two episodes: the Mytilene brothel scenes in Act IV, among Shakespeare's best comic writing; and the two reunion scenes in Act V, some of the canon's finest examples of Shakespeare's ability to make grown men cry. In this production, these scenes flow stylistically from the scenes preceding them and thus lose their singular charms and emotional power. Out of fairness, I have to caveat my criticism. We had our own particular obstacles to overcome in fully appreciating the production. One was our front-row seats with the stage at my eye level: We could see upstage action just fine, but when the actors moved downstage, we not only were looking up at a 90-degree angle, we were distracted by the clear faults in hair piece and makeup application (though I can't be sure these obvious fake costumes were intentional to the play's overall Greek drama aesthete). Two was sitting through an almost three-hour "elegiac" production at the end of a long day that included a Broadway play, two big meals, and intellectually stimulating conversation with my son, who spent the whole day with us: I drifted in and out of consciousness for much of the Pericles's second half. My experience thus runs contrary to the enthusiastic applause the rest of the audience bestowed upon the production, to the near-unanimous praise from New York's critics, and TFANA extending the play's run by two weeks. It's also possible that all that accolade could be a case of the Nunn + Shakespeare = Gotta Be Good factor, something I've often seen in New York where pedigree trumps true theatrical achievement. I certainly bought into the Nunn pedigree, and still do. While I might not agree with his choices on both a Shakespearean and entertainment/engagement level, this production features a couple of his trademark qualities that are highlights of the show. Foremost among them is the original music written by Shaun Davey and performed live on stage and in a gallery above. The costumes by Constance Hoffman are gorgeous: intricately designed long robes for the men and dresses for the women that are operatic in nature, mythological in scope. In embracing so fully the material we're given in this Pericles and Wilkins' novel, Nunn stages some scenes particularly well. One is the parade of contestants in the tournament at Pentapolis, which prior to this version I've never seen presented so effectively, assisted by the Polonsky Shakespeare Center's deep-thrust stage configuration. With Simonides (John Rothman) upstage and Thaisa (Gia Crovatin) midstage, each knight steps in front of her, kneels, and holds up his shield for her to peruse their emblems. When the production is faithfully rendered in this way, we get the dramatic effect of the recently shipwrecked Pericles (Christian Camargo) appearing as "the mean knight," holding up not a real shield but a construction of interwoven sticks and branches to form a shield's shape. Gower, a 14th century poet who translated the original tale into English, upon which Pericles is based, serves as the play's narrator. Though he is not nearly as dynamic as his only other counterpart in the canon, Chorus in Henry V, he has the device of "dumb shows" (mimed representations of his narration) to rely on. Nunn adds a dumb show of his own when Gower (Raphael Nash Thompson) describes Marina (Lilly Englert) growing up as the foster daughter of Cleon (Will Swenson) and Dionyza (Nina Hellman) alongside their daughter, Philoten (Sam Morales). We see the true friendship the two girls share, but we also see clearly how much more accomplished Marina is (though Morales's Philoten is oblivious to the comparison). We see Dionyza trying to get Philoten married off, but, the suitors seeing the two girls together, pay no heed to the princess. And we see Dionyza ache for her daughter with a mother's love, and that ache transition into murderous envy toward Marina. Much press has been expended on Nunn's creating a Shakespeare production from the ground up with American actors. While acknowledging how the two theater cultures generally have different approaches to acting, this storyline insinuates a quality differential between American- and British-trained actors, especially with Shakespeare. Taurus droppings, I say. The best Shakespearean performances I've seen have come from as many American actors as British actors—check out my top 10 Shakespeareances. It's all a matter of individual talent and ensembles, and this production has a few standouts. Rothman overcomes the production's formality-laden discipline and a weird beard to bring real comic essence to his portrayal of Simonides, Thaisa's father who becomes Pericles's doting father-in-law. Philip Casnoff raises the muddled role of Helicanus, Pericles's most devoted advisor in the Tyrean court, into a heroic force. Two actors do triple duty in giving memorable performances: John Keating and Ian Lassiter as lords of Tyre and fishermen of Pentapolis, and in two opposite roles in the Mytilene scenes, Keating as a slimy but ultimately pragmatic Boult and Lassiter as Governor Lysimachus, who somehow not only wins over Marina—though he starts off as a customer in the brothel—but us, too. Camargo hews doggedly to the melodramatically 2-D construction of the title role as written in the first half of the play, in particular playing Pericles's depression to the hilt. Man, this guy is a wet rag at a party—even I, who suffer chronic depression, wanted to shout, "lighten up, dude!" It fits the early scenes and presents a counterpoint to Simonides and Thaisa in the middle scenes, but the performance undermines the Shakespearean nuances of the final scenes. Thompson's Gower, meanwhile, is a truly theatrical figure. 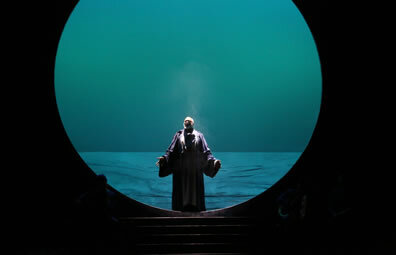 He emerges from a giant, gold circle at the back of the stage: It looks like a sun, but opens to reveal an endless sea behind Gower. Thompson presents Gower's tale through the script's archaic rhyming schemes but with a twinkle in his eye. He notably continues his role right through the curtain call, taking his bow and then in grand gesture heading back to the sun, which closes on him as he beams a smile of great success. This is the triumphant charm I had been looking for throughout the show. Nunn, I know, can deliver such a sustained sensation, as can Shakespeare. I'm not sure Wilkins can. I just felt I should throw in my 2 cents on this production. I, too, went with high hopes and dragged a number of my students to this show as well, only to be sorely disappointed. I would go farther than Eric to say that the stylization rendered some scenes stiflingly boring. There was sparse, polite laughter at the brothel scenes where I am accustomed to raucous enjoyment. The choice to place an accomplished singer beside Marina and face her upstage as if to fool us was insulting and unnecessary as Marina could have used some other gift to awake the wounded king (in my production, Marina played the violin…and why not?). And between Marina speaking one. word. at. a. time. during her revelations and then the goddess Diana doing the same and making an eight-line speech into a 10-minute monologue, I was ready to leap from the balcony and strangle them! This was not the work of a dedicated Shakespearean director lending everything he knows to bringing an obscure play to life. Milking speeches like that is not respectful of the metre or flow of the beautiful words that Shakespeare wrote. It is indulgent and ineffective. In short I came away deeply disappointed and wondering why Mr. Nunn had such a reputation. Certainly, it did not help matters that our Mezzanine usher fell asleep in his chair behind us and snored quite musically for most of the second half (there was no one next to him to elbow him). And I would encourage TFANA to cast their net a trifle wider and find another actress to play their ingenues. There are so many talented women in New York. Surely, there must be someone else they would consider working with in future, if only to put one less deterrent to my returning to their theater. I can't imagine I'm alone in thinking this.